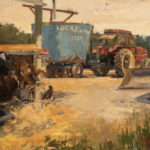 Suzie Baker, Mill at El Rancho de las Golondrinas, oil, 20 x 24. The historic mill is on the grounds of the legendary El Rancho de las Golondrinas (Ranch of the Swallows) on El Camino Real, a major trade route linking Mexico City with Santa Fe that dates back to the 1700s. 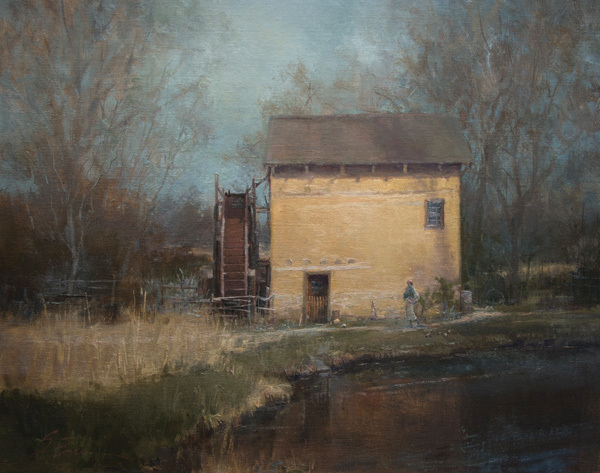 This month Baker’s painting of the scene, MILL AT EL RANCHO DE LAS GOLONDRINAS, is on view in Oil Painters of America’s National Juried Exhibition in St. George, UT. Suzie Baker, Day in the Life, oil, 18 x 24. Suzie Baker, Faithful Morning, oil, 20 x 30. 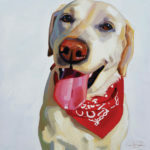 Suzie Baker, Harvey Was Here, oil, 16 x 16. Suzie Baker, High and Dry, oil, 16 x 20. 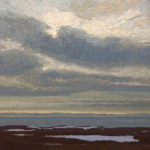 Suzie Baker, Sky, Land, and Ocean, oil, 16 x 20. Suzie Baker, Sunset, Moonrise, oil, 8 x 24. 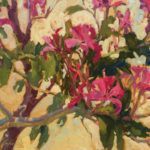 Baker grew up in a small, central Louisiana town where, early on, she established a reputation among peers and teachers as “the art kid” in the classroom. She enjoyed drawing, and fortunately teachers recognized her gifts. In high school, after she had taken all of the art classes that were available, the school created a special art program tailored just for her. So it came as no surprise to her family and friends that, when the time for college arrived, she chose to pursue a degree in fine arts and advertising at Louisiana Tech University. 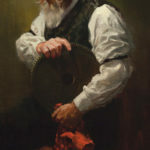 After graduating in 1992, Baker worked for a small design firm in Monroe, LA. A few years later, and now married, she moved from her native Louisiana to Houston after her husband’s company transferred him. In Houston, Baker once again secured a job at an advertising agency and quickly moved up the ranks to an art-director position. Eventually she established her own successful firm, Baker Art and Design Studio. 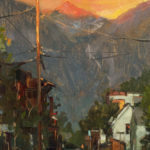 Suzie Baker, Alpenglow, oil, 12 x 9. Suzie Baker, Vigil, oil, 24 x 30. Suzie Baker, Leimomi, oil, 18 x 14. 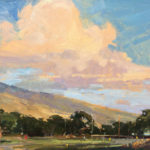 As this story was going to press, Baker had just returned from the plein-air invitational in Maui. 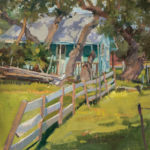 When we caught up with her, she was settling back into her home studio in Shenandoah, a small town north of Houston. If visitors step inside her ranch-style house, the first thing they notice are the paintings covering the walls of the foyer. 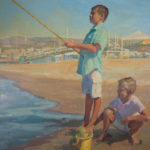 There is an array of landscapes and figurative works by Charles Hunter, Colin Page, and Rob Liberace, with whom she once studied, and a dozen more that she has traded or purchased from other artists. “It’s like having a hallway full of friends,” Baker says. 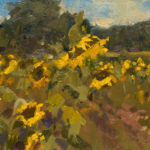 Suzie Baker, Facing the Sun, oil, 6 x 6. Suzie Baker, Gateway to the Canyon, oil, 24 x 36. Suzie Baker, Hong Kong Orchid, oil, 16 x 20. Look to the left of the foyer, where one might expect to find a living or dining room, and voilà—the space is overrun with more paintings, palettes, easels, work tables, brushes, flat files, and frames. Baker says she “annexed” the rooms for her studio space long ago. “Occasionally, my studio tries to exert Manifest Destiny onto the rest of the house, but I usually manage to marshal it back,” she jokes. While her studio may not be a beautiful space, she says, it is “utilitarian,” and that’s good enough for her. Luckily, Baker says, her husband is supportive. He puts up with the territorial takeover and the occasional whiff of oil paint wafting about. “I often say that the best art supply is a supportive spouse or partner,” she says. When it comes to beauty, Baker has her own definition. She isn’t necessarily interested in painting “picture-perfect, postcard” scenes featuring fields of bluebonnets or other beautiful views. 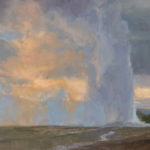 She can see and create something beautiful amid devastation, rubble, and ruin with her masterful compositions, her ability to capture striking light effects, and her spirited use of color. 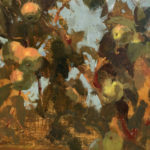 Suzie Baker, How’d Ya Like Them Apples, oil, 12 x 16. 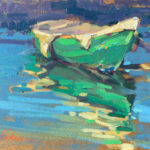 Suzie Baker, Little Green Boat, oil, 6 x 8. 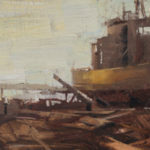 Suzie Baker, Log Built Boat, oil, 10 x 30. 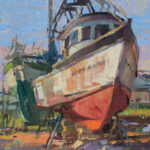 In another Rockport scene, titled HIGH AND DRY, she depicts a boat resting on a rack waiting for repairs. More piles of lumber can be seen in the foreground. 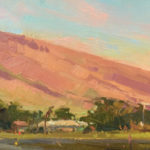 “Although recording history is not my primary concern when choosing subject matter, I am aware that we, as plein-air artists, are recording places and events in our present time,” she says. “Painting scenes that show what the community faced in Harvey’s aftermath is an example of this pictorial record-keeping.” Evidently, her peers in the show thought the pieces were much more than just pictorial records. 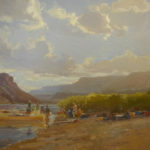 HIGH AND DRY won Best of Show, and HARVEY WAS HERE won the Artists’ Choice Award. 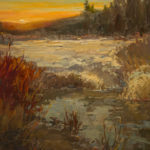 Authentique Gallery of Art and Design, St. George, UT; Pitzer’s Fine Art, Wimberley, TX; The Gallery at Round Top, Round Top, TX; Tartaglia Fine Art, Ojai, CA; Lovetts Gallery, Tulsa, OK.
Suzie Baker, Virginia Meadows, oil, 18 x 24. 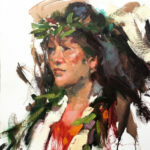 Suzie Baker, Tuls Commission, oil, 30 x 40. 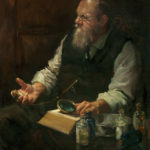 Suzie Baker, To Every Purpose, oil, 20 x 40. 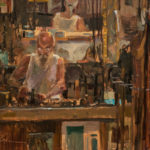 Suzie Baker, Sandal Maker, The Gentle Art, oil, 16 x 20.